As we dive into summer, I want to share one of my favorite salad recipes of all time. The history behind this yummy salad goes all the way back to one of my first events I attended as a military spouse. Like most parties and get togethers, military families love doing pot luck’s. This always eases the cooking burden of the host and also gives everyone the opportunity to share their own favorite recipes. 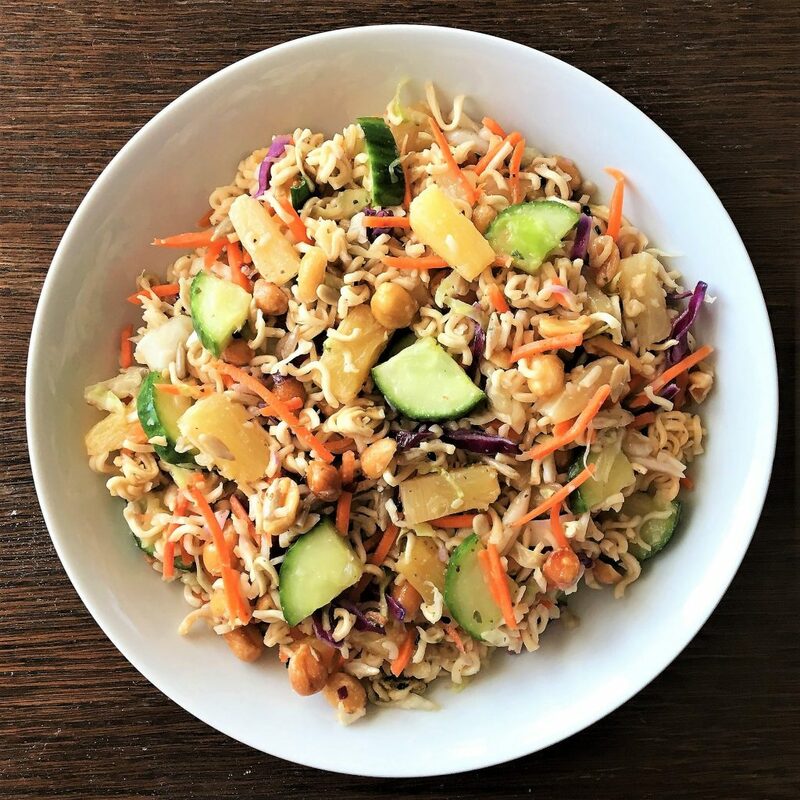 Well, this recipe for Healthy Asian Ramen Salad was originally known as just plain old Asian Ramen Salad, minus the Healthy. Someone brought it is a big bowl and quickly shared the recipe as we all swooned over it. It is a very easy salad that combines ramen noodles, cabbage, and onions in a dressing made using the flavor packet from the ramen noodles. The original recipe is so delicious, but it’s made with loads of oil and sugar. Of course all the “naughty” ingredients that go into the salad are what make it so yummy. Through the years I found several different versions of the recipe in almost every military spouse recipe collection I came across. However, I never found a light version of the salad. So, I decided to come up with my own make over recipe for Healthy Asian Ramen Salad. 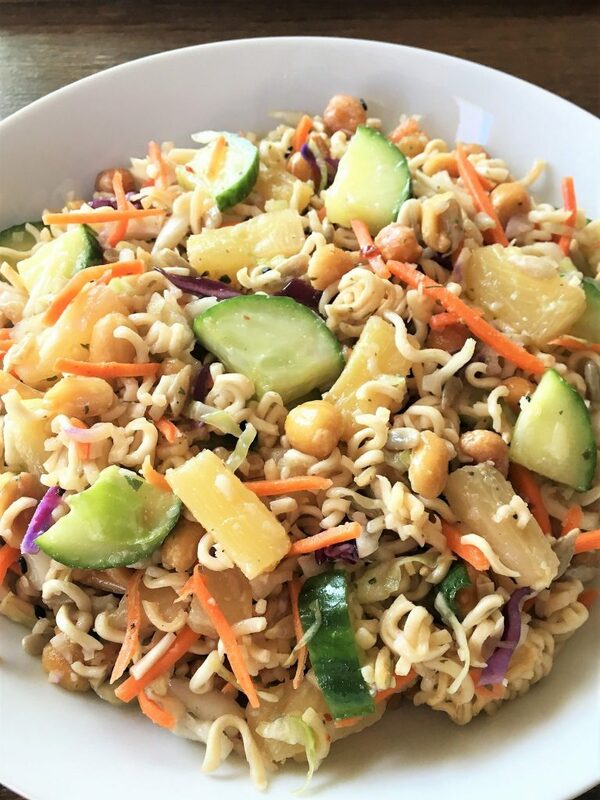 Some of the changes I made, in order to create a Healthy Asian Ramen Salad, were quite simple. I cut way back on the amount of oil in the dressing, eliminated the ramen flavor packet to cut down on the sodium, and instead added some extra flavor punches with vinegar, light soy sauce and spices. One spice I especially love is Asian Style Sprinkle that I order from Savory Spice Shop. I use it in all of my stir fry and other Asian recipes. Now, you don’t have to run out and order this spice blend to make the recipe. I gave you some substitute spices in the mean time. The next trick was to cut back on the amount of sugar and substitute with natural sugar from pineapple juice and honey. Finally, and I teach this in all of my cooking classes…add lots of extra vegetables and fruit to make any recipe better for you. I added extra of all the veggies from the original recipe and the addition of some new ones. You can go even further by adding edamame, celery, and water chestnuts…get as creative as you like. The more veggies, the better! This salad is great if you make it ahead of time. The sweet and sour flavors come together so beautifully and the ramen, nuts and sunflower seeds add the extra crunch. So, enjoy this easy, fresh salad this weekend and with any of your picnics and barbecues this summer. 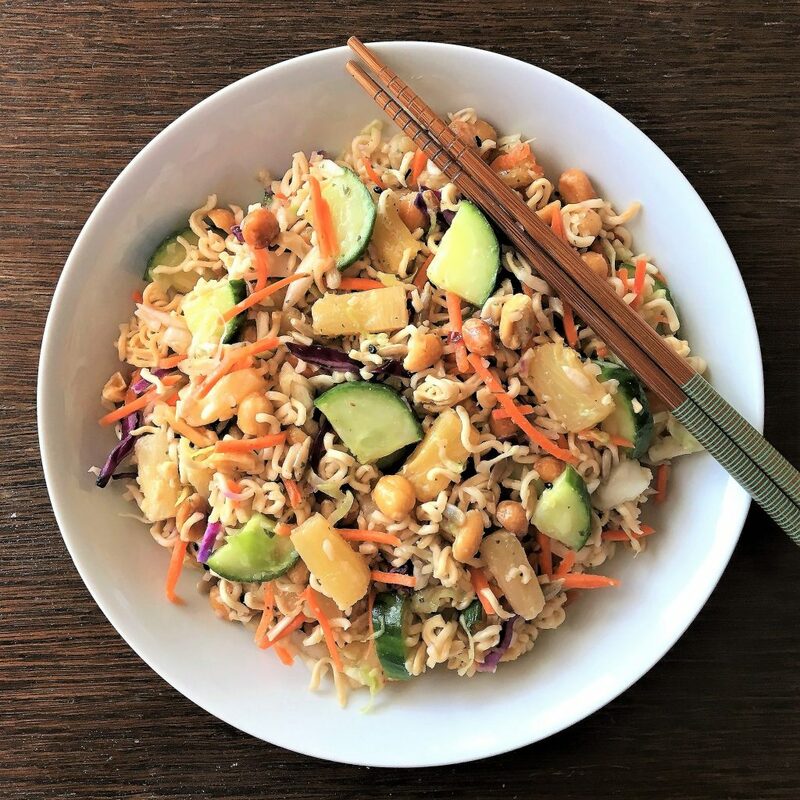 Just another chance to enjoy a flavorful salad, that after a few tweaks, becomes a Healthy Asian Ramen Salad. Happy Summer and Healthy Cooking from the Memorable Kitchen! Preheat the oven to 350 degrees. Take noodles out of the package and break up slightly. Discard the seasoning packets. Place ramen noodles on a baking sheet. Bake for 5-7 minutes until slightly toasted, tossing every few minutes. Place in a large bowl. In a small bowl, whisk together the olive oil, vinegar, pineapple juice, soy sauce, honey, garlic powder, red pepper flakes and sesame seeds. See notes. 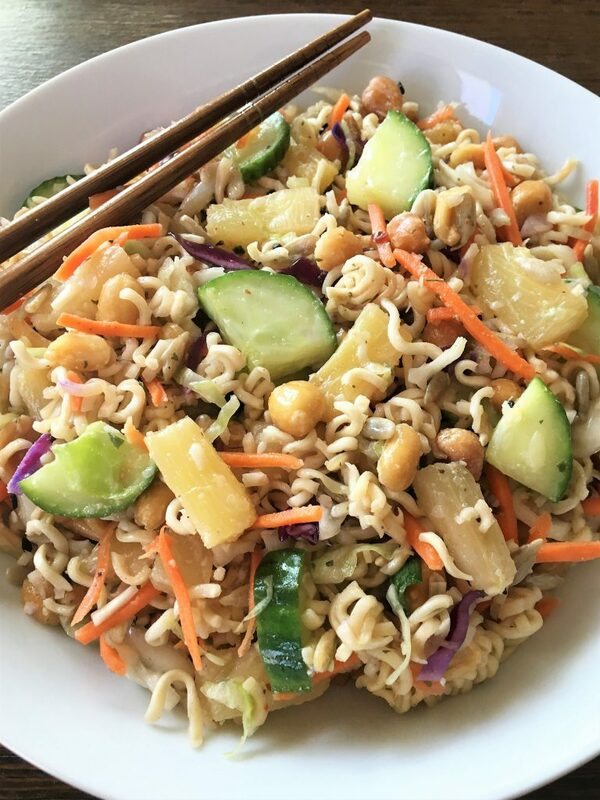 Combine the coleslaw mix, carrots, cucumber, onion and pineapple in the bowl with the ramen noodles. Pour in the dressing and toss lightly. Add more dressing if desired. Chill for at least 1 hour. When ready to serve, toss in the sunflower seeds and peanuts. Note #1: This recipe is very light on the dressing. You can double the dressing portion of the recipe and add extra as you like. Use the remainder in other Asian Salad creations! Note #2: You can substitute 1 tablespoon Asian Style Sprinkle for the garlic powder, red pepper flakes and sesame seeds.